It’s always the right time for less screen time. Time is a scarce resource. And these days we all spend way too much of it with our noses buried in a phone. Even when we’re with family, friends, driving our cars – that darn phone is in our hands and in our faces. 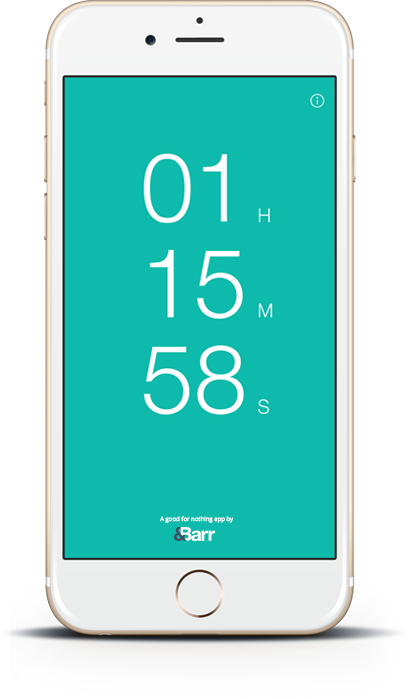 So we’ve created an app that encourages you to take occasional breaks from your phone on a daily basis. And as a reward for the time you spend doing nothing on your phone, we’ll go out in the world and do good on your behalf. The more breaks you take, the more good we do. You &Barr, doing good for the community. And ourselves. Just download the app. Start the timer. And take a break from your phone for the greater good. Put down your phone and enjoy some of these good for nothing activities. Enter your email and we’ll keep you posted on the good we do on your behalf.